Spectrum Surgical is pleased to offer their new surgical instrument stain remover wipes. The wipes can be used to remove rust, stains and water deposits from surgical instruments. Spectrum Surgical Instruments Corp. is pleased to offer their new Spectra-Wipes™, Surgical Instrument Stain Remover Wipes. 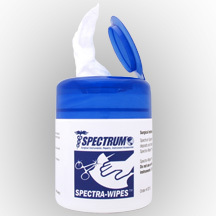 Spectra-Wipes™ remove rust, stains, water deposits, and discoloration from surgical instruments. To use, gently rub affected area with cloth until the stain is no longer visible. Spectra-Wipes™ clean and polish, and come packaged in an easy-to-use pull-up dispenser of twenty (20), 5.5-inch by 7.9-inch towelettes.